Most Corporate gifts are boring, uninspired and just plain forgetable. The main reason I have found is because an intern, secretary or business person is doing the research on the gift in between bathroom breaks. You could however let me find something meaningful, memorable and wonderful while you do the job you excel at. Now go enjoy that little bathroom break! 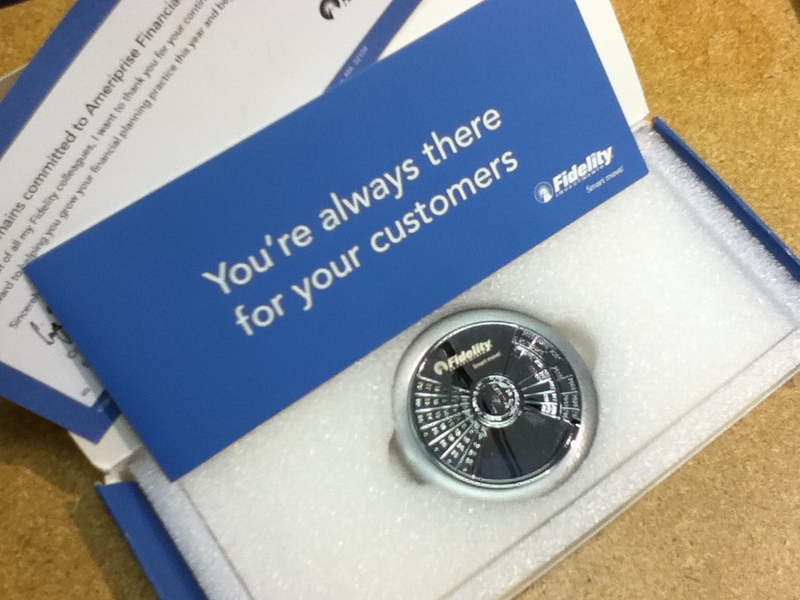 Fidelity came to us with a project. They wanted to tell a group of associate business partners, Ameriprise there business was important to Fidelity and they would always be there for them. Once I determined the message they were hoping to convey, the quantity and the budget I suggested several gift ideas. Above is the stainless steel desktop 50 Year calendar paperweight. This was the chosen gift, it really hit the meaning and it hit the budget. We produced 5000 pcs overseas, engraved with the Fidelity logo laser engraved. Other services: Specialty and custom Gifts for clients, staff, volunteers, donors, sales launches, office parties. Event Planning and Office Furnishings.